Adams’ revolutionary credentials secured him two terms as George Washington’s vice president and his own election in 1796 as the second president. During his one term as president, he encountered ferocious attacks by the Jeffersonian Republicans, as well as the dominant faction in his own Federalist Party led by his bitter enemy Alexander Hamilton. Adams signed the controversial Alien and Sedition Acts, and built up the army and navy especially in the face of an undeclared naval war (called the “Quasi-War”) with France, 1798–1800. The major accomplishment of his presidency was his peaceful resolution of the conflict in the face of Hamilton’s opposition. In 1800, Adams was defeated for re-election by Thomas Jefferson and retired to Massachusetts. He later resumed his friendship with Jefferson. He and his wife founded an accomplished family line of politicians, diplomats, and historians now referred to as the Adams political family. Adams was the father of John Quincy Adams, the sixth President of the United States. His achievements have received greater recognition in modern times, though his contributions were not initially as celebrated as those of other Founders. Adams was the first U.S. president to reside in the executive mansion that eventually became known as the White House. 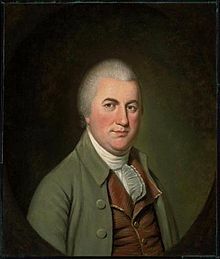 John Adams, the eldest of three sons, was born on October 30, 1735 (October 19, 1735 Old Style, Julian calendar), in what is now Quincy, Massachusetts (then called the “north precinct” of Braintree, Massachusetts), to John Adams, Sr., and Susanna Boylston Adams. Adams’s birthplace is now part of Adams National Historical Park. His father (1691–1761) was a fifth-generation descendant of Henry Adams, who emigrated from Somerset in England to Massachusetts Bay Colony in about 1638. The elder Adams, the descendant of Puritans, continued in this religious tradition by serving as a Congregationalist deacon; he also farmed and served as a lieutenant in the militia. Further he served as a selectman, or town councilman, and supervised the building and planning of schools and roads. Adams commonly praised his father and indicated that he and his father were very close when he was a child. Susanna Boylston Adams was a member of one of the colony’s leading medical families, the Boylstons of Brookline. Though raised in materially modest surroundings, Adams felt acutely that he had a responsibility to live up to his family heritage: he was a direct descendent of the founding generation of Puritans, who came to the American wilderness in the 1630s, established colonial presence in America, and had a profound effect on the culture, laws, and traditions of their region. Journalist Richard Brookhiser, drawing on the relevant historiography, has written that these Puritan ancestors of Adams’s “believed they lived in the Bible. England under the Stuarts was Egypt; they were Israel fleeing … to establish a refuge for godliness, a city upon a hill.” By the time of John Adams’ birth in 1735, Puritan tenets such as predestination were no longer as widely accepted, and many of their stricter practices had mellowed with time, but John Adams “considered them bearers of freedom, a cause that still had a holy urgency.” It was a value system he believed in, and a heroic model he wished to live up to. Young Adams went to Harvard College at age sixteen in 1751. His father expected him to become a minister, but Adams had doubts. After graduating in 1755 with an A.B., he taught school for a few years in Worcester, allowing himself time to think about his career choice. After much reflection, he decided to become a lawyer, writing his father that he found among lawyers “noble and gallant achievements” but among the clergy, the “pretended sanctity of some absolute dunces.” He later became a Unitarian, and dropped belief in predestination, eternal damnation, the divinity of Christ, and most other Calvinist beliefs of his Puritan ancestors. Adams then studied law in the office of John Putnam, the leading lawyer in Worcester. In 1758, after earning an A.M. from Harvard, Adams was admitted to the bar. From an early age, he developed the habit of writing descriptions of events and impressions of men which are scattered through his diary. He put the skill to good use as a lawyer, often recording cases he observed so that he could study and reflect upon them. His report of the 1761 argument of James Otis in the Massachusetts Superior Court as to the legality of Writs of Assistance is a good example. Otis’s argument inspired Adams with zeal for the cause of the American colonies. On October 25, 1764, five days before his 29th birthday, Adams married Abigail Smith (1744–1818), his third cousin and the daughter of a Congregational minister, Rev. William Smith, at Weymouth, Massachusetts. Their children were Abigail (1765–1813); future president John Quincy Adams (1767–1848); Susanna (1768–1770); Charles (1770–1800); Thomas Boylston (1772–1832); and Elizabeth (1777). Adams first rose to prominence as an opponent of the Stamp Act 1765, which was imposed by the British Parliament without consulting the American legislatures. Americans protested vehemently that it violated their traditional rights as Englishmen. Popular resistance, he later observed, was sparked by an oft-reprinted sermon of the Boston minister, Jonathan Mayhew, interpreting Romans 13 to elucidate the principle of just insurrection. In 1765, Adams drafted the instructions which were sent by the inhabitants of Braintree to its representatives in the Massachusetts legislature, and which served as a model for other towns to draw up instructions to their representatives. In August 1765, he anonymously contributed four notable articles to the Boston Gazette (republished in The London Chronicle in 1768 as True Sentiments of America, also known as A Dissertation on the Canon and Feudal Law). In the letter he suggested that there was a connection between the Protestant ideas that Adams’ Puritan ancestors brought to New England and the ideas behind their resistance to the Stamp Act. In the former he explained that the opposition of the colonies to the Stamp Act was because the Stamp Act deprived the American colonists of two basic rights guaranteed to all Englishmen, and which all free men deserved: rights to be taxed only by consent and to be tried only by a jury of one’s peers. The “Braintree Instructions” were a succinct and forthright defense of colonial rights and liberties, while the Dissertation was an essay in political education. Six of the soldiers were acquitted. Two who had fired directly into the crowd were charged with murder but were convicted only of manslaughter. Adams was paid eighteen guineas by the British soldiers, or about the cost of a pair of shoes. In 1772, Massachusetts Governor Thomas Hutchinson announced that he and his judges would no longer need their salaries paid by the Massachusetts legislature, because the Crown would henceforth assume payment drawn from customs revenues. Boston radicals protested and asked Adams to explain their objections. In “Two Replies of the Massachusetts House of Representatives to Governor Hutchinson” Adams argued that the colonists had never been under the sovereignty of Parliament. Their original charter was with the person of the king and their allegiance was only to him. If a workable line could not be drawn between parliamentary sovereignty and the total independence of the colonies, he continued, the colonies would have no other choice but to choose independence. In Novanglus; or, A History of the Dispute with America, From Its Origin, in 1754, to the Present Time Adams attacked some essays by Daniel Leonard that defended Hutchinson’s arguments for the absolute authority of Parliament over the colonies. In Novanglus Adams gave a point-by-point refutation of Leonard’s essays, and then provided one of the most extensive and learned arguments made by the colonists against British imperial policy. It was a systematic attempt by Adams to describe the origins, nature, and jurisdiction of the unwritten British constitution. 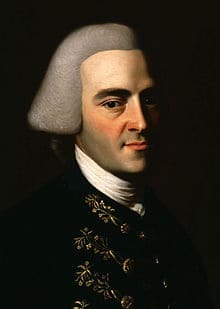 Adams used his wide knowledge of English and colonial legal history to argue that the provincial legislatures were fully sovereign over their own internal affairs, and that the colonies were connected to Great Britain only through the King. File:Declaration independence.jpg|thumb|300px|right|Trumbull’s Declaration of Independence depicts committee presenting draft Declaration of Independence to Congress. Adams at center has hand on hip.|alt=depicts the five-man committee presenting the draft of the Declaration of Independence to Congress.Massachusetts sent Adams to the first and second Continental Congresses in 1774 and from 1775 to 1777. In June 1775, with a view of promoting union among the colonies, he nominated George Washington of Virginia as commander-in-chief of the army then assembled around Boston. His influence in Congress was great, and almost from the beginning, he sought permanent separation from Britain. Over the next decade, Americans from every state gathered and deliberated on new governing documents. As radical as it was to write constitutions (prior tradition suggested that a society’s form of government need not be codified, nor its organic law written down in a single document), what was equally radical was the revolutionary nature of American political thought as the summer of 1776 dawned. Several representatives turned to Adams for advice about framing new governments. To relieve Adams of the burden of repeatedly writing out his thoughts, Richard Henry Lee published one Adams’ version, as the pamphlet “Thoughts on Government” (April 1776), which was subsequently influential in the writing of state constitutions. Using the conceptual framework of Republicanism in the United States, the patriots believed it was the corrupt and nefarious aristocrats, in the British Parliament, and their minions stationed in America, who were guilty of the British assault on American liberty. The treatise also defended bicameralism, for “a single assembly is liable to all the vices, follies, and frailties of an individual.” He also suggested that there should be a separation of powers between the executive, the judicial, and the legislative branches, and further recommended that if a continental government were to be formed then it “should sacredly be confined” to certain enumerated powers. “Thoughts on Government” was enormously influential and was referenced as an authority in every state-constitution writing hall. On May 10, 1776, Adams seconded Richard Henry Lee’s resolution calling on the colonies to adopt new (presumably independent) governments. Adams then drafted a preamble to this resolution which elaborated on it, and which Congress approved on May 15. The full document was, as Adams put it, “independence itself” and set the stage for the formal passage of the Declaration of Independence. Once the combined document passed in May, independence became inevitable, though it still had to be declared formally. On June 7, 1776, Adams seconded the resolution of independence introduced by Richard Henry Lee which stated, “These colonies are, and of right ought to be, free and independent states,” and championed the resolution until it was adopted by Congress on July 2, 1776. After the defeat of the Continental Army at the Battle of Long Island on August 27, 1776, Admiral Richard, Lord Howe requested the Second Continental Congress send representatives in an attempt to negotiate peace. A delegation including Adams and Benjamin Franklin met with Howe on Staten Island on September 11. Both Howe’s authority and that of the delegation were limited, and they were unable to find common ground. When Lord Howe unhappily stated he could only view the American delegates as British subjects, Adams replied, “Your lordship may consider me in what light you please, […] except that of a British subject.” Lord Howe then addressed the other delegates, stating, “Mr. Adams appears to be a decided character.” Adams learned many years later that his name was on a list of people specifically excluded from Howe’s pardon-granting authority. In 1777, Adams began serving as the head of the Board of War and Ordnance, as well as serving on many other important committees. In this capacity, he became a “one man war department” working eighteen-hour days and mastering the details of raising, equipping, and fielding an army under civilian control. He also authored the “Plan of Treaties,” laying out the Congress’ requirements for the crucial treaty with France. Congress twice dispatched Adams to represent the fledgling union in Europe, first in 1777, and again in 1779. He was accompanied, on both occasions, by his eldest son, John Quincy Adams (who was ten years old at the time of the first voyage). Adams sailed for France aboard the Continental Navy frigate Boston on February 15, 1778. The trip through winter storms was treacherous, with lightning injuring 19 sailors and killing one. Adams’ ship was then pursued by but successfully evaded several British frigates in the mid-Atlantic. Toward the coast of Spain, Adams himself took up arms to help capture a heavily armed British merchantman ship, the Martha. Later, a cannon malfunction killed one and injured five more of Adams’ crew before the ship finally arrived in France. Adams was in some regards an unlikely choice inasmuch as he did not speak French, the international language of diplomacy at the time. His first stay in Europe, between April 1, 1778, and June 17, 1779, was largely unproductive, and he returned to his home in Braintree in early August 1779. Between September 1 and October 30, 1779, he drafted the Massachusetts Constitution together with Samuel Adams and James Bowdoin. He was selected in September 1779 to return to France and, following the conclusion of the Massachusetts constitutional convention, left on November 14 aboard the French frigate Sensible. On the second trip to Paris, Adams was appointed as Minister Plenipotentiary charged with the mission of negotiating a treaty of peace, amity and commerce with peace commissioners from Britain. The French government, however, did not approve of Adams’ appointment and subsequently, on the insistence of the French foreign minister, the Comte de Vergennes, Benjamin Franklin, Thomas Jefferson, John Jay and Henry Laurens were appointed to cooperate with Adams, although Jefferson did not go to Europe and Laurens was posted to the Dutch Republic. In the event Jay, Adams, and Franklin played the major part in the negotiations. Overruling Franklin and distrustful of Vergennes, Jay and Adams decided not to consult with France. Instead, they dealt directly with the British commissioners. After the peace negotiations began, Adams had spent some time as the ambassador in the Dutch Republic, then one of the few other Republics in the world (the Republic of Venice and the Old Swiss Confederacy being the other notable ones). In July 1780, he had been authorized to execute the duties previously assigned to Laurens. With the aid of the Dutch Patriot leader Joan van der Capellen tot den Pol, Adams secured the recognition of the United States as an independent government at The Hague on April 19, 1782. During this visit, he also negotiated a loan of five million guilders financed by Nicolaas van Staphorst and Wilhelm Willink. In October 1782, he negotiated with the Dutch a treaty of amity and commerce, the first such treaty between the United States and a foreign power following the 1778 treaty with France. The house that Adams bought during this stay in The Netherlands became the first American-owned embassy on foreign soil anywhere in the world. For two months during 1783, Adams lodged in London with radical publisher John Stockdale. In 1784 and 1785, he was one of the architects of far-going trade relations between the United States and Prussia. The Prussian ambassador in The Hague, Friedrich Wilhelm von Thulemeyer, was involved, as were Jefferson and Franklin, who were in Paris. 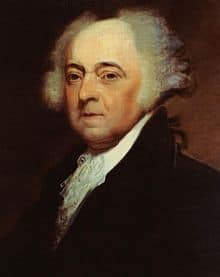 John Adams, America’s first ambassador, said to my ancestor, King George III, that it was his desire to help with the restoration of “the old good nature and the old good humor between our peoples.” That restoration has long been made, and the links of language, tradition, and personal contact have maintained it. While in London, John and Abigail had to suffer the stares and hostility of the Court, and chose to escape it when they could by seeking out Richard Price, minister of Newington Green Unitarian Church and instigator of the Revolution Controversy. Both admired Price very much, and Abigail took to heart the teachings of the man and his protégée Mary Wollstonecraft, author of A Vindication of the Rights of Woman. Adams’ home in England, a house off London’s Grosvenor Square, still stands and is commemorated by a plaque. He returned to the United States in 1788 to continue his domestic political life. Massachusetts’s new constitution, ratified in 1780 and written largely by Adams himself, structured its government most closely on his views of politics and society. It was the first constitution written by a special committee and ratified by the people. It was also the first to feature a bicameral legislature, a clear and distinct executive with a partial (two-thirds) veto (although he was restrained by an executive council), and a distinct judicial branch. Adams’ Defence can be read as an articulation of the classical republican theory of mixed government. Adams contended that social classes exist in every political society, and that a good government must accept that reality. For centuries, dating back to Aristotle, a mixed regime balancing monarchy, aristocracy, and democracy—that is, the king, the nobles, and the people—was required to preserve order and liberty. Adams never bought a slave and declined on principle to employ slave labor. Abigail Adams opposed slavery and employed free blacks in preference to her father’s two domestic slaves. John Adams spoke out in 1777 against a bill to emancipate slaves in Massachusetts, saying that the issue was presently too divisive, and so the legislation should “sleep for a time.” He also was against use of black soldiers in the Revolution, due to opposition from southerners. Adams generally tried to keep the issue out of national politics, because of the anticipated southern response. Though it is difficult to pinpoint the exact date on which slavery was abolished in Massachusetts, a common view is that it was abolished no later than 1780, when it was forbidden by implication in the Declaration of Rights that John Adams wrote into the Massachusetts Constitution. 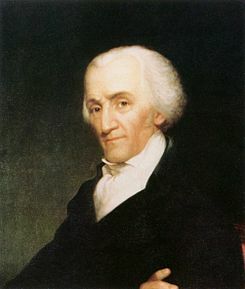 While Washington won the presidential election of 1789 with 69 votes in the electoral college, Adams came in second with 34 votes and became Vice President. According to David McCullough, what he really might have wanted was to be the first Chief Justice of the Supreme Court of the United States. He presided over the Senate but otherwise played a minor role in the politics of the early 1790s; he was reelected Vice President in 1792. Washington seldom asked Adams for input on policy and legal issues during his tenure as vice president. As president of the Senate, Adams cast 29 tie-breaking votes—a record that only John C. Calhoun came close to tying, with 28. His votes protected the president’s sole authority over the removal of appointees and influenced the location of the national capital. On at least one occasion, he persuaded senators to vote against legislation that he opposed, and he frequently lectured the Senate on procedural and policy matters. Adams’ political views and his active role in the Senate made him a natural target for critics of the Washington administration. Toward the end of his first term, as a result of a threatened resolution that would have silenced him except for procedural and policy matters, he began to exercise more restraint. When the two political parties formed, he joined the Federalist Party, but never got on well with its dominant leader Alexander Hamilton. Because of Adams’ seniority and the need for a northern president, he was elected as the Federalist nominee for president in 1796, over Thomas Jefferson, the leader of the opposition Democratic-Republican Party. His success was due to peace and prosperity; Washington and Hamilton had averted war with Britain with the Jay Treaty of 1795. The 1796 election was the first contested election under the First Party System. Adams was the presidential candidate of the Federalist Party and Thomas Pinckney, the Governor of South Carolina, was also running as a Federalist (at this point, the vice president was whoever came in second, so no running mates existed in the modern sense). The Federalists wanted Adams as their presidential candidate to crush Thomas Jefferson’s bid. Most Federalists would have preferred Hamilton to be a candidate. Although Hamilton and his followers supported Adams, they also held a grudge against him. They did consider him to be the lesser of the two evils. However, they thought Adams lacked the seriousness and popularity that had caused Washington to be successful and feared that Adams was too vain, opinionated, unpredictable, and stubborn to follow their directions. Adams’ opponents were former Secretary of State Thomas Jefferson of Virginia, who was joined by Senator Aaron Burr of New York on the Democratic-Republican ticket. Adams’ term was marked by intense disputes over foreign policy, in particular a desire to stay out of the expanding conflict in Europe. Britain and France were at war; Hamilton and the Federalists favored Britain, while Jefferson and the Democratic-Republicans favored France. The French wanted Jefferson to be elected president, and when he wasn’t, they became even more belligerent. When Adams entered office, he realized that he needed to continue Washington’s policy of staying out of the European war. Indeed, the intense battle over the Jay Treaty in 1795 permanently polarized politics up and down the nation, marking the start of the First Party System. The French saw America as Britain’s junior partner and began seizing American merchant ships that were trading with the British. Americans remained pro-French, due to France’s assistance during the Revolutionary War. Because of this, Americans wouldn’t rally behind Adams, nor anyone else, to stop France.